This weekend, our partners at United to End Genocide, or UEG, are hosting a series of online and offline events to mark the end of genocide awareness month and bring attention to the rapidly deteriorating humanitarian situation in Sudan and South Sudan. Beginning today, activists across the U.S. and abroad will begin spreading the word on Facebook and urging people to take action. 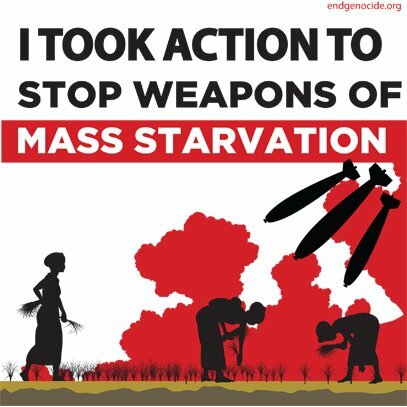 UEG is asking their supporters to update their Facebook banner with their Sudan—Stop Weapons of Mass Starvation canvass, and to post a similar image to their page to call attention to the situation in Sudan. Additionally, they are asking people to take action by telling their congressmen to support the Sudan Peace, Security and Accountability Act of 2012. The advocacy weekend will culminate on Sunday afternoon, when hundreds of activists and supporters will gather in D.C. for the Hope in Darfur—Justice in Sudan rally. Speakers for the rally include: Tom Andrews, former congressman and president of United to End Genocide; Ruth Messinger, president of American Jewish World Service; and Joe Madison, civil and human rights advocate and Satellite XM radio host, as well as other religious and diaspora leaders. Funds raised will be donated to "Sudan Sunrise" to build a school kitchen where nutritious meals will be prepared for children so that they are better positioned to learn. As the onset of the rainy season draws nearer and tensions along the border continue, there is an urgent need for humanitarian aid and international engagement in Sudan, especially in the four most affected regions: Darfur, South Kordofan, Blue Nile, and Abyei. Please join us in supporting our partners at United to End Genocide as we work together to make sure the United States and the international community takes action to end the injustices and ongoing violence of the Bashir regime.